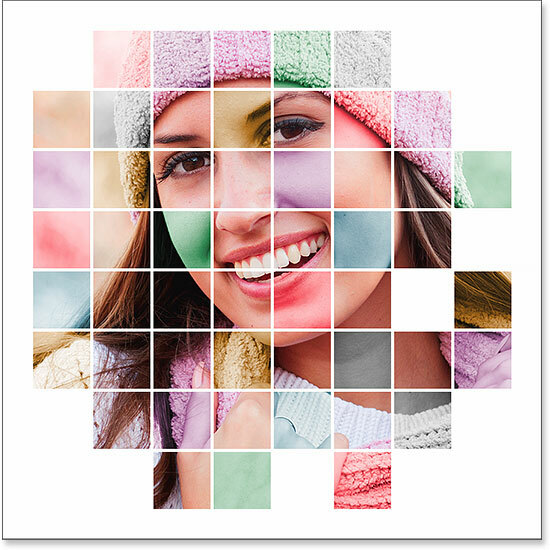 In this photo effects tutorial, we’ll learn how to display a photo in a grid of randomly colored squares! We’ll use Photoshop’s built-in grid feature as a guide for setting up the initial spacing, then we'll turn it into a pixel-based grid using a couple of Photoshop's rarely-used selection tools. We’ll see how to easily select different squares in the grid with the Magic Wand Tool, how to colorize them with adjustment layers and blend modes, and finally, how to adjust the appearance of the grid itself using layer styles! This version of the tutorial has been updated for Photoshop CS6 and is also fully compatible with Photoshop CC (Creative Cloud). 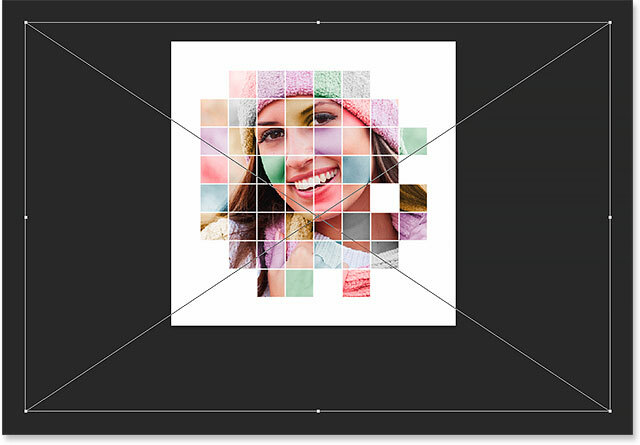 For CS5 and earlier, you'll want to check out our original Color Grid Design tutorial. Creating a new Photoshop document with the New dialog box. Going to View > Show > Grid. The document after turning on Photoshop's grid. Selecting the Guides, Grid & Slices preferences. Setting Gridline Every to 10 Percent and Subdivisions to 1. The grid after changing the options in the Preferences. Step 4: Add A New Blank Layer And Name It "Grid"
The Grid layer appears in the Layers panel. Click and hold on the Rectangular Marquee Tool, then select the Single Row Marquee Tool. 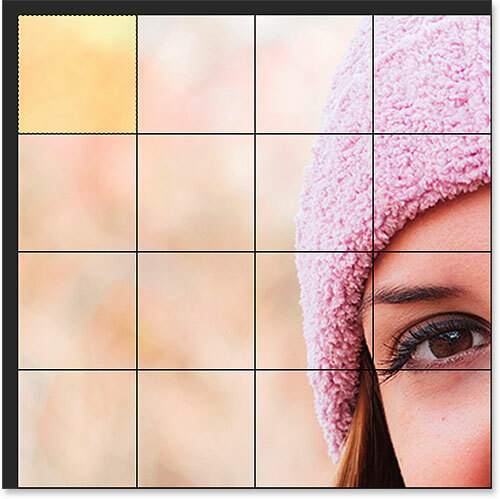 Click anywhere on the first horizontal grid line at the top to select the entire row of pixels. 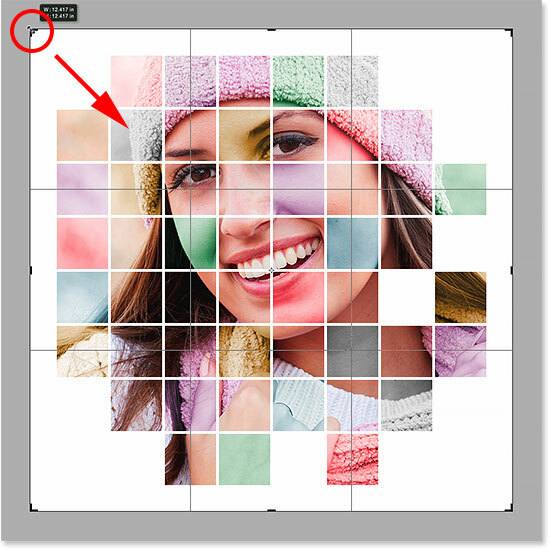 Press and hold Shift and click on each horizontal grid line to add it to the selection. Click and hold on the Single Row Marquee Tool, then select the Single Column Marquee Tool. All horizontal and vertical grid lines have been added to the selection. Setting the Use option to Black. The document showing the newly created grid. Your photo will open in a separate tabbed document. Switching from the photo's document to the grid document. The photo has been pasted into the grid. The photo appears between the Background and Grid layers. The layer's name has been changed from "Layer 1" to "Photo". 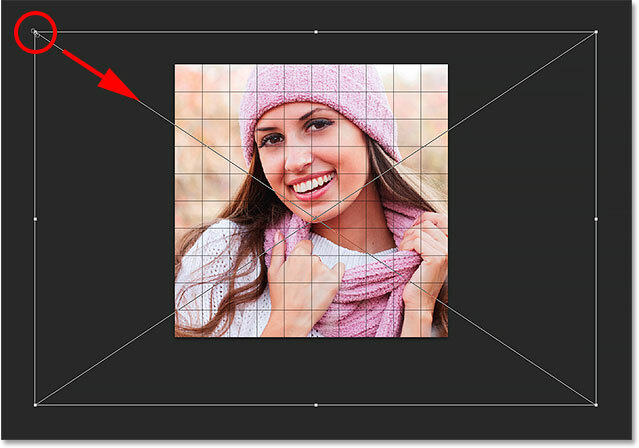 Dragging a corner handle to resize the image inside the grid. Going to View > 100%. Click and hold on the Quick Selection Tool, then choose the Magic Wand Tool. The square in the top left corner of the grid is selected. All squares around the outer edges of the grid are now selected. Naming the new layer "White". The Layers panel showing the new White layer. A border of white squares now appears around the image. Make sure you select the Grid layer before trying to select any squares. 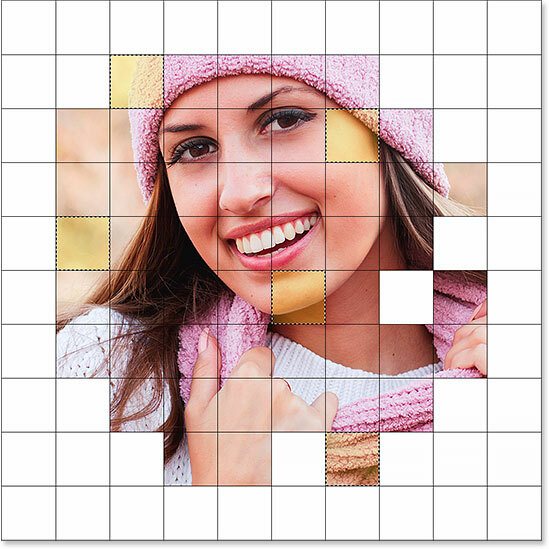 Press and hold Shift and click inside a few different squares to select them. 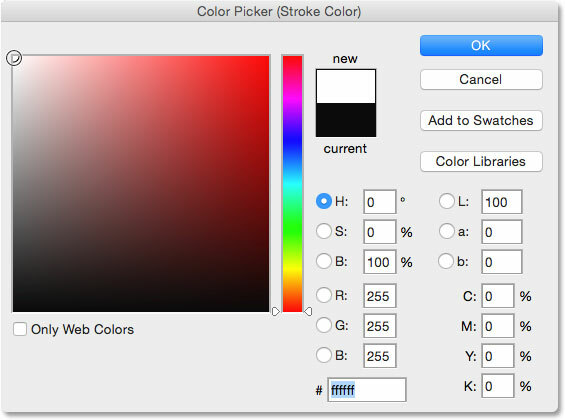 Click the Colorize option, then choose a color with the Hue and Saturation sliders. The first of the colorized squares. Renaming the Hue/Saturation adjustment layer based on the color. Repeat steps 22-27 to select and colorize more squares. 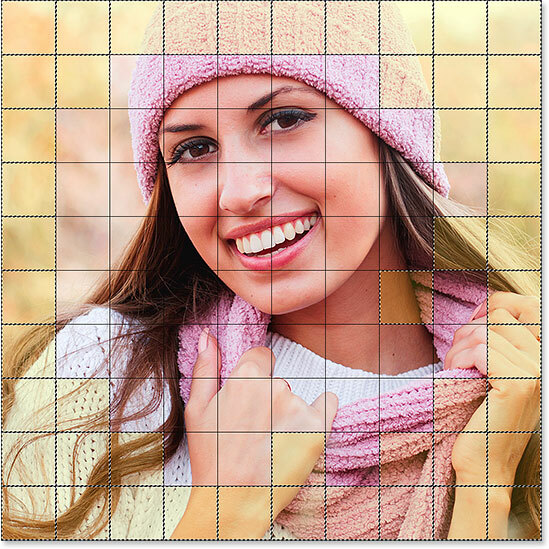 First select the Grid layer in the Layers panel, then press and hold your Shift key and click inside a few squares with the Magic Wand Tool to select them. Click on the Photo layer in the Layers panel to select it, then click on the New Adjustment Layer icon and choose Hue/Saturation. In the Properties panel, check the Colorize option, then choose a color with the Hue slider and a saturation level with the Saturation slider. Change the blend mode of the new adjustment layer to Color, then rename the adjustment layer based on the color you chose. Dragging the Saturation slider all the way to the left will turn the selected squares black and white. The effect after colorizing more of the squares. The Layers panel showing the adjustment layers. Clicking the Grid layer to select it. Clicking the Lock Transparent Pixels icon. With the Lock Transparent Pixels option enabled, anything we do to the layer will affect only the grid lines themselves. It will have no effect on the transparent areas of the layer. This way, if we fill the layer with, say, white (as we're about to do), only the grid lines will be filled with white. The transparent areas will remain transparent. Leave the Use option set to White and click OK. The effect after changing the color of the grid lines to white. Choosing white in the Color Picker. 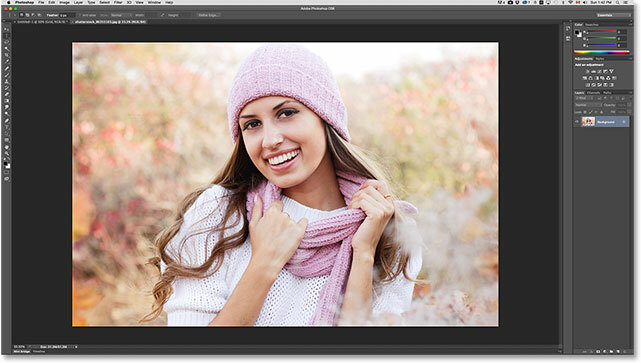 Setting Position to Outside and the Size to 2 px. The image after applying the Stroke layer style. Re-adjust the size and position of the photo (if needed) with Free Transform. The final size and position of the photo. Setting the Aspect Ratio option to Original Ratio. Pressing Alt (Win) / Option (Mac) and dragging a corner crop mark. And there we have it! That's how to display a photo inside a grid of colors with Photoshop! For similar tutorials, see our Shape Cluster Photo Effect or our Vertical Photo Panels Effect tutorials. Or visit our Photo Effects section for more Photoshop effects tutorials!